FILE PHOTO:A Syrian opposition flag is erected at the Syrian-Jordanian border at the Nasib crossing in Deraa province, Syria August 27, 2017. AMMAN - Syrian opposition groups are resisting Jordanian pressure to hand control of a border crossing back to the Syrian government, a step that would be a major boost for President Bashar al-Assad and undermine rebel groups in southwestern Syria. Talks over reopening the Nasib crossing have gathered pace since a Russian-U.S. brokered ceasefire in July brought relative calm to southern Syria, the first peacekeeping effort in the war by U.S. President Donald Trump’s administration. Jordan, which hopes to revive a once flourishing trade route and encourage Syrian refugees to return, has plenty of leverage over the rebels: many of the opposition groups in southern Syria depend on logistical support from the staunch U.S. ally. But rebel groups which seized control of the crossing in 2015 have so far resisted proposals for a return of Syrian government authority to Nasib, even in the form of civilian officials with no Syrian army presence. The possibility of the crossing being reopened underlines just how far the scales have tipped in favor of Assad, who is steadily winning back territory with Russian and Iranian help, forcing neighboring states to rethink their policies. “The presence of any regime employee is like restoring legitimacy to a worn-out regime against which the Syrian people rose up,” said Adham al Karad, a Free Syrian Army (FSA) rebel commander who led battles in Deraa city against the army. Jordan has trodden a careful path during the six-year long war, maintaining diplomatic ties with Damascus even as it became a hub for a U.S.-led program that funneled aid to vetted Syrian rebels. Trump recently decided to shut down that program. Before the Syrian conflict erupted in 2011, Nasib served as a major transit route for hundreds of trucks a day transporting goods between Turkey and the Gulf in multi-billion dollar annual trade. Its closure has also had a knock-on effect for other economies in the region, including Lebanon‘s. Jordan has put forward proposals by which rebels would secure the road to Nasib, 100 km (60 miles) from the capital, while a civil administration from Damascus would run the crossing, according to Syrian opposition officials. Rebels would receive a portion of the customs fees as part of the deal. The proposals were discussed during a meeting between the Jordanian government and opposition-run local councils and rebels from southern Syria in Amman at the end of last month. “The situation of the crossing is delicate and sensitive and until now we have not responded (to Amman’s demands),” Ali Salkhadi, the governor of opposition-run Deraa province, told a meeting of local figures on Sunday, footage of which was posted on YouTube. Jordan told the opposition delegation that it was obliged to deal with a recognized state in order to open the crossing and to allow trucks to proceed to third countries, he said. It also threatened the opposition delegation it could open another land crossing into Syrian government-controlled Sweida province, east of Nasib, if rebels fail to reach a deal. “If they open Sweida crossing they would close the other humanitarian crossings ... this is what they are saying,” Salkhadi said in the meeting. Syrian government officials could not be reached for comment. A Jordanian government official contacted by Reuters declined to comment. Though rebels stand to profit if the crossing were opened, they also risk losing local support if seen to make such a big concession to Damascus. They want long-standing demands, including a detainee release, addressed before talks on Nasib. “We will not watch with our hands tied, we won’t allow this and will work to stop all the efforts to hand over critical areas to the regime and to confiscate them from the rebels and impose a fait accompli on us,” said Abu Jasem al Hariri, a rebel commander in southern Syria. Jordan last month succeeded in pressuring two Western-backed rebel groups operating in southeastern Syria near the Jordanian border, an order that resulted in them abandoning their territory to advancing Syrian government forces. But while Amman has recently sought to mend fences with Damascus, a full restoration of ties seems a distant prospect as Jordan remains deeply concerned over expanding Iranian influence in Syria. The Syrian army and allied militia are steadily seizing more and more of the Jordanian frontier from insurgents. But while the government is gaining ground at the Jordanian border, key crossings to Turkey and Iraq remain outside its control. 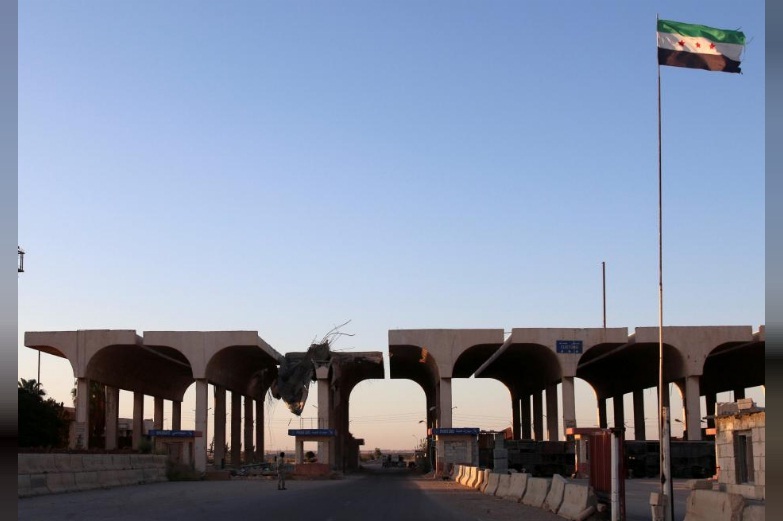 Syrian opposition groups are resisting Jordanian pressure to hand control of a border crossing back to the Syrian government, a step that would be a major boost for President Bashar al-Assad and undermine rebel groups in southwestern Syria.